Part of the fun for me in doing a trunk show on Main Street is that it gives me a good excuse to visit shops and restaurants outside of my neighbourhood. And if you’re visiting my pop-up shop this week, I recommend you visit them too. I open at 11 a.m. on Thursday and Friday, so if you’re dropping by midday, may I suggest you have lunch at Coco et Olive at Main & 22nd — the hot chicken sandwich is worth driving across town for. If you’re arriving later in the day — I’m open until 7 p.m. — the French Table is just four blocks north of my trunk show at Little Mountain Shop. I know many of you have a thing for beautiful stationery with clever sayings on it, so don’t miss The Regional Assembly of Text, near 24th. The shop has a vintage feel, not least because of all the typewriters decorating it. And who doesn’t need a tea towel with a map of Vancouver on it? I can never get enough of independent bookshops and there are two near my trunk show. Book Warehouse on Main is just three blocks away from me, and is also dog friendly. And then there’s Carson Books, a secondhand bookstore just a few doors down. No relation, but obviously a kindred spirit. At the top of my reading list: Esi Edugyan’s Washington Black, which just won the Giller Prize. Need to supply yourself with greenery and flowers for parties, stocking stuffers for the green-of-thumb, or maybe sign-up up for a wreath-making workshop? The Flower Factory is just a block away and they have a lovely Instagram. Party season is right around the corner, so I’m holding one of my biannual public trunk shows at the Designers Collective shop in Vancouver. Friday Oct. 27 – 4 p.m. to 8 p.m.
Saturday Oct. 28 – 11 a.m to 5 p.m.
Sunday Oct. 29 – 11 a.m. to 5 p.m. If you don’t know Designers Collective, it’s a hub for creative people run by my friends Brooke Hatfield and Tina Dhillon who will redo your interiors for you, or teach you how to do it yourself. They also do field trips to study design in other cities and organize pop-up shops featuring local artisans. This pop-up shop also includes paintings by Donna Tangye, another one of my talented friends. You can seem some of her recent work at her website. Hope to see you at there. 164 W. 5th Ave. at Columbia St.
I’ll be showing some of my new pieces, including more of my layered looks. 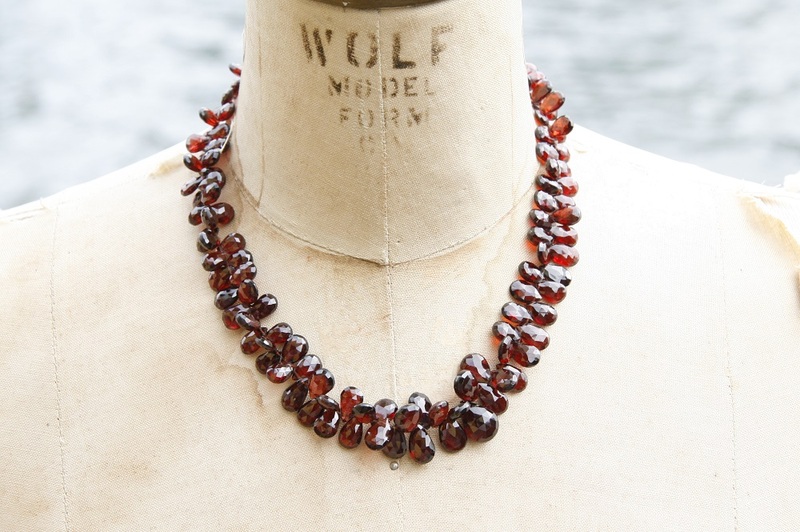 And I’ll be sharing some of my tricks for getting the most out of your necklace wardrobe. If you don’t know clothing designer Rozemerie Cuevas’s work have a look at the JAC website. It’s fashion for grown-ups: elegant, edgy, and something you won’t ever find in any chain store. I hope you can join us for a glass of wine and a glimpse of what’s new on the style front. Here’s a glimpse of some of the new pieces. 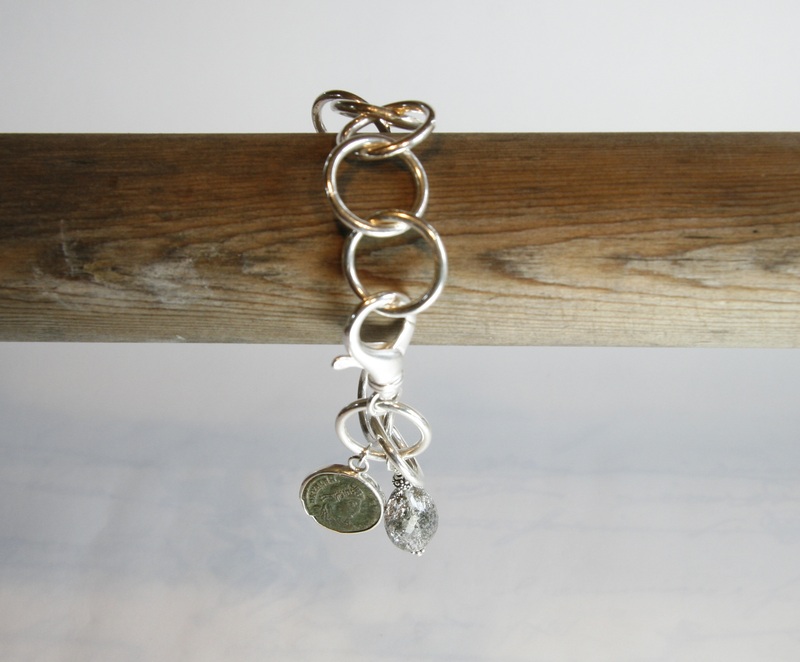 So I’m happy to report that I have a few of these heavyweight sterling silver bracelets accented with an antique Roman coin and a phantom quartz, at $325. But it’s true that many of my pieces are one-of-kind. 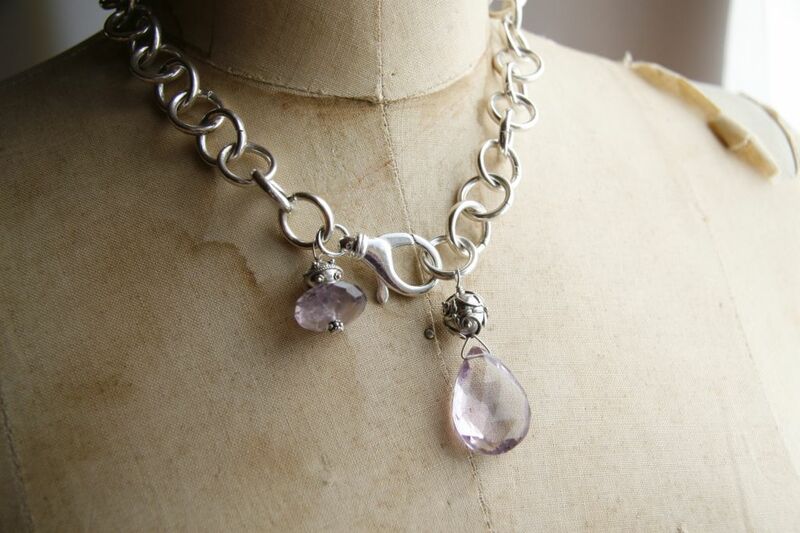 Like these two necklaces, layered: Baroque pearls with lilac amethyst accent stone and a marcasite toggle clasp, $545. 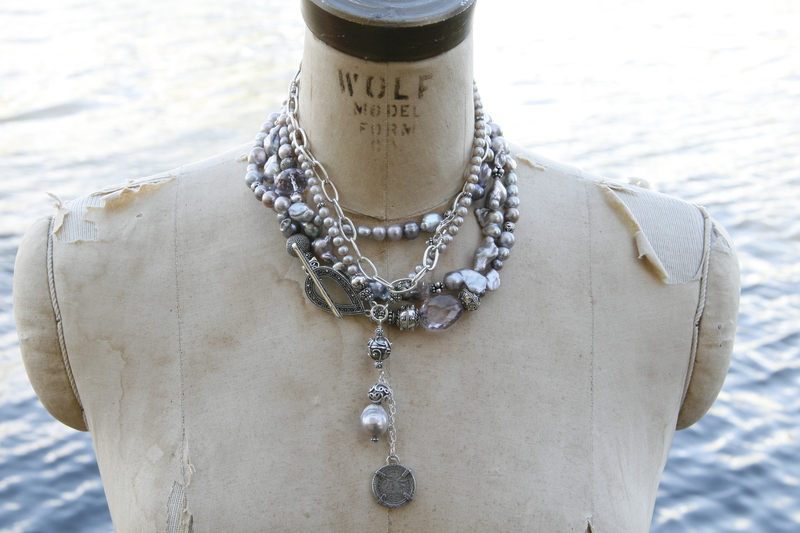 Sterling silver chain with baroque pearl accents and an antique silver coin, $435. I feel awful having to say something is sold out. 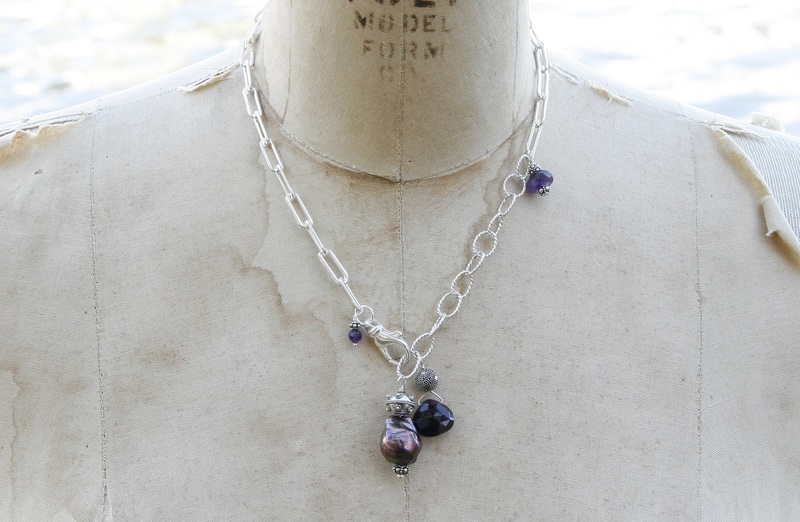 While I can sometimes create a variation on the piece in the photograph, the truth is that I can only lay my hands on so many matched amethysts or aquamarines. Often that means making just one fabulous piece. That’s why only a handful of my designs find their way to the online store. 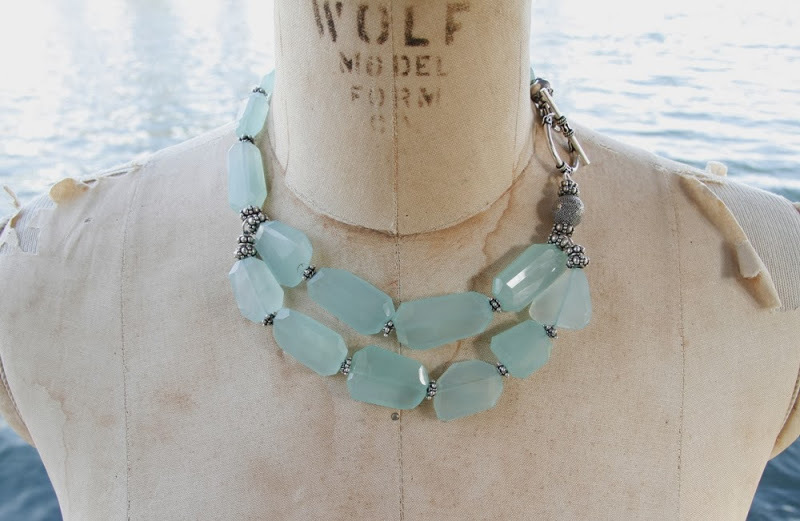 I need to have enough stones to make more than one, which is why this gorgeous collar of sea green chalcedony, $310, is available in the shop. I can still fill these orders. Even with earrings, I often do only three or four pairs of one design, because I need to have identically matched stones. Since I deal in natural gems and pearls it means that within every strand of turquoise or garnets I buy I can find only a few twins. 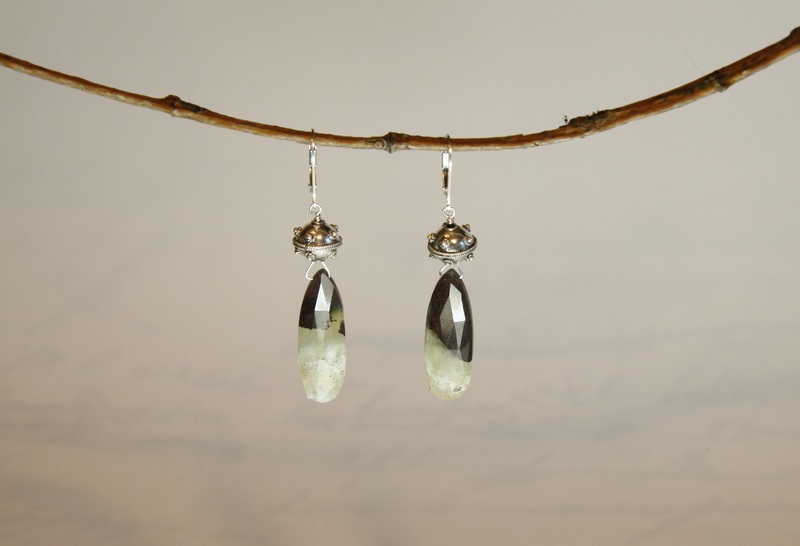 For example, there are so few of these delicate, green-hued prehnite and matrix earrings with a silver bead accent, $110, that they will probably be gone before my May 1 trunk show at the Granville Island Hotel. But I can never resist the subtle green stones. I know it’s frustrating for new customers to hesitate over making a purchase and then decide, only to find the piece they had their hearts set on is gone. But that is exactly why clients come to Anne Carson Design instead of a mass-producer like Tiffany’s. They want to wear something no one else has. 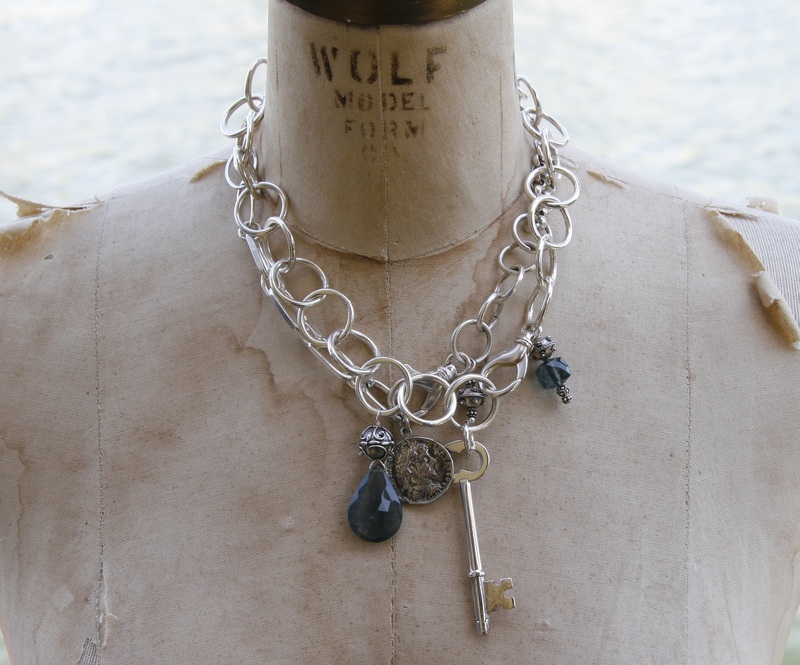 And please come by my trunk show for a glass of wine and to peruse my latest one-of-kind pieces. You never know what you’ll find. My friend Nadine of Casa Home Decor and I are joining forces to do an open house featuring ‘Modern Accessories for Spring’ on April 9, at her shop in the Armoury District. I’m showing new pieces designed to brighten up winter wardrobes while we’re waiting for spring to get serious. And Nadine is showing felt home accessories from Daff, a fabulous line of felt products from Germany, made from high quality merino wool. They’re sleek and sophisticated and come in both cheery primary colours and soft earth tones that suggest wood and stone. I’m a sucker for the bags, which are light and strong as well as stylish. 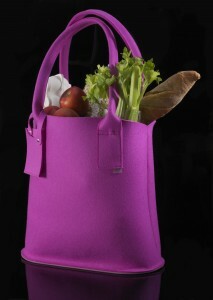 A much nicer way to tote groceries than a ratty backpack. Wednesday April 9, 4 p.m. to 8 p.m. Even if you’re not in the shopping mood, come by and say hi over wine and appies.